Emily has been gone to GA camp since Monday. She’ll be home this afternoon. With the exception of times that she has visited grandparents, this is the first time she has been away from home for more than one night. We went to visit her last night for family night, and she is having a great time. I am looking forward to her return. Her absense has made me realize how much the boys depend on her for entertainment. They have kept us busy. On Monday, Timothy decided he wanted his bed to be turned into a bunkbed again. We had taken it down last Fall because he was having some trouble getting off the bed to go the bathroom in the middle of the night. Now that he’s older, that shouldn’t be a problem. So, we put the bed up and rearranged toys to occupy the space that his bed used to have. 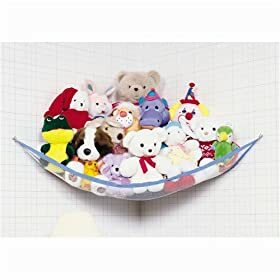 We installed some pet nets for stuffed animals in each room and arranged their toys on them. The rest of the day was spent playing with toys we had pulled from the closet to fill the space in their room. It was a fun day. On Tuesday, the boys and I went to a local library where Kenny’s Korral had set up a petting zoo. Kenny’s Korral is Lubbock’s answer to not having a zoo. Timothy’s class had gone there on a field trip in May, so he was very excited to get to see Kenny and the animals again. Zachary really liked seeing the animals. He even fed a goat from his hand. He said it ticked. An added bonus for Zachary was getting see a friend from school. The two of them hugged for a long time and even exchanged a couple kisses. This really disturbed the friend’s older sister, who said she would get in trouble for doing that. Her babysitter and I told her it’s okay at 3, but not 7. She seemed okay with that. The rest of the day was spent running some errands and more playing. We had considered going to see Emily, but decided it would be better to go on family night so she wouldn’t be one of the few kids without parents there. On Wednesday, we went swimming. The boys had been begging to go, so we finally consented. We knew we had to leave town by 4 to go see Emily, so we decided to go to the pool as soon as it opened at 12. We were the first ones there. Scott was quite proud that he was the first person in the water that day. We swam for a couple hours, then decided to head home for lunch and then off to see Emily. We were at camp for about an hour and a half before heading home. It was wonderful getting to see Emily and hear about all the fun she’s had. When it was time for her to go to worship, we tearfully said goodbye and headed home. When we got home, we changed the bedding in Sneakers cage and gave him fresh food. We put him in his ball and let him run around the first floor of the house for a while. He moves fast! That has been our week with only two kids. It’s been a little quieter and a lot less exciting without Emily. She’ll be home in just a few hours, so I better get some things done so I can spend some quality time with her. I am sure she will have lots of camp stories to share. ← What to do when your spare is flat.